The S&P BSE Sensex lost 378 points or 1.05 per cent to settle at 35,514 with HCL Tech (up 0.50 per cent) being the top gainer and ONGC (down 3.59 per cent) the worst laggard. 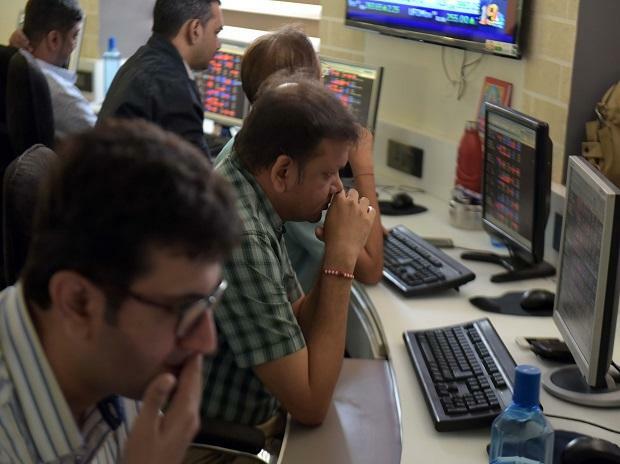 Weak global cues, nervousness ahead of the start of third quarter corporate earnings and selling in metals, auto, IT and financial counters triggered another 1 per cent decline in the domestic stocks on Thursday. Equities on Wednesday, too, shed around 1 per cent. The S&P BSE Sensex lost 378 points or 1.05 per cent to settle at 35,514 with HCL Tech (up 0.50 per cent) being the top gainer and ONGC (down 3.59 per cent) the worst laggard. HDFC, Reliance Industries (RIL), Larsen & Toubro and HDFC Bank contributed the most to the index's fall while Bajaj Auto, Asian Paints and Hindustan Unilever advanced the most. Out of 2,726 companies traded on BSE, 957 advanced and 1,619 declined while 150 stocks remained unchanged. On NSE, the broader Nifty50 index slipped below 10,700 level to close at 10,672, down 120 points or 1 per cent. Out of 50 components, 42 ended in the red and just eight in the green. As many as 41 securities hit 52-week lows on NSE. The list included names such as Bharat Forge, Hinduja Ventures, and Lux Industries. On the contrary, four stocks hit their 52-week high. Sectorally, metal stocks cracked the most followed by media, auto and IT stocks. The Nifty Metal index slipped 68 points or 2.25 per cent to settle at 2,960.40, with all the 15 constituents declining. JSPL, Hindalco and Tata Steel fell between 3-7 per cent. In the broader market, The S&P BSE MidCap index lost 156 points or 1 per cent to settle at 15,076 while the S&P BSE SmallCap index closed at 14,573, down 86 points or 0.58 per cent. Shares of Vijaya Bank and Dena Bank tanked up to 20% on the BSE on Thursday following an unfavorable share-swap ratio on their merger with Bank of Baroda. Shares of Jet Airways (India) slipped over 6% to Rs 247 on Thursday, falling over 11% in the past two trading days on BSE, after the rating agency ICRA on Wednesday downgraded the airline’s Rs 10,963 crore loan and debenture ratings. “ICRA has revised the long-term rating (assigned to long-term loans and non-convertible debentures) to D from C. The short-term rating has been revised to D from A4,” Jet Airways said in a statement. The rupee was trading on a weak note having slipped to 70.52 against the dollar in intra-day trade. On Wednesday, the domestic unit crashed 75 paise, its first loss in last four sessions, to close at 70.18 amid strengthening of the greenback and heavy selling in domestic equities. US stock futures fell and Asian shares wobbled on Thursday after a rare revenue warning from Apple Inc added to worries about slowing global growth and weaker earnings. MSCI's broadest gauge of Asia-Pacific shares outside Japan fell 0.4 per cent after an early attempt at a bounce. Japanese markets were closed for holidays but Nikkei futures dropped 1.9 per cent. Shares in China and Hong Kong see-sawed between gains and losses as investors waited for Beijing to roll out fresh support measures for the cooling Chinese economy. Market at close The S&P BSE Sensex ended at 35,514, down 378 points or 1.05 per cent, while the broader Nifty50 index settled at 10,672, down 120 points or 1.11 per cent.